Known as the "Roof of the World" at an average altitude of about 4,500 meters (14,763.8 feet), Tibet has spectacular and fascinating snow-capped peaks, high mountains, thrilling glaciers, billowy wild rivers, highland turquoise lakes, vast pastoral areas with unique wildlife, magnificent monasteries, and above all, the Tibetan people and their overwhelming cultures make Tibet one of the most fascinating destination on the planet - this is Tibet! Tibet is no doubt one of people's most wanting places to visit in the world. Here are some of the must-see sights and monuments of Tibet in the Himalayas: a holy circuit (Kora) around the Jokhang Temple on the Barkor Street, get awe of the majesty of the Potala Palace on the Red Hill in Lhasa, pay a visit to the "Big Three" Monasteries in Lhasa, the Drepung, Sera and Ganden Monastery, get inspired by the marvel Kumbum Stupa and Pelkor Chode in Gyantse by the Kyichu River, visit Panchen Lama's seat the Tashilunpo Monastery and enjoy bargaining in the free market in Shigatse, walk up in the morning sun at the holy Nam Tso Lake, the largest saltwater lake in the world, driving on the Sino-Nepal Friendship Highway to view the magnificent Mt. Everest standing at the world's highest monastery - Rongbuk Monastery, taking a three-day Mt. Kailash Kora alongside local Tibetan, and have a cup a butter tea in a local Tibetan's home. Tibet Journeys are ready-made itineraries that cover all the inspiring culture highlights and astonishing natural landscapes across the Land of Snows. Private journeys including Lhasa Tours, Tibet Claasic Trips, Mt.Everest Excursions, Mt.Kailash and Lake Manasarovar Odyssey, and Tibet Adventures etc. All trips can be tailor-made according to your wishes and desire. The transportation in Tibet has changed and been improved a lot especially during the past three decades. Now Tibet can be accessible by plane, train and by bus. 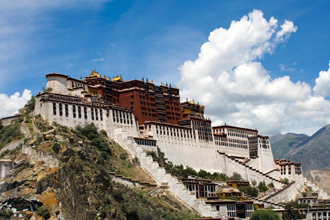 The most fast and convenient way is getting Lhasa, Tibet by air. 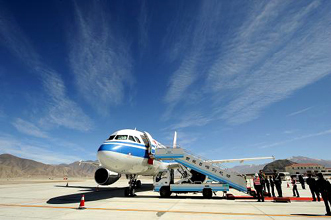 Lhasa's Gonggar Airport has flight links other major cities on the Chinese mainland such as Beijing, Xi'an, Chengdu, Kunming, Guangzhou, Chongqing, Shanghai, and Kathmandu in Nepal. Among all the cities, Chengdu is the most important hub which has the most flights to Lhasa on a daily basis. Most travelers choose Chengdu as their gateway to Lhasa, Tibet. 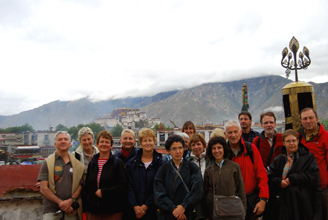 Traveling to Tibet by overland trips is getting popular for these who have a longer and flexible travel plan. There are five highways stretching into Tibet from the Chinese Mainland and Nepal, namely, Sichuan -- Tibet Highway, Yunnan -- Tibet Highway, Qinghai -- Tibet Highway, Xinjiang -- Tibet Highway, and the Sino-Nepal Friendship Highway from Lhasa via the border town Zhangmu/Dram to Kathmandu,Nepal. There are four documents required for foreign tourists who want to travel to Tibet. They are: 01). Chinese Visa, which you can apply for in the Chinese Embassy or Consulate General in your country (for these go from the Chinese mainland); 02). Tibet Entry Permit, which is also widely called as the 'TTB Permit', issued by Tibet Tourism Bureau (a must document to enter Tibet regardless the types of transportation taken); 03). Alien's Travel Permit (PSB Permit), is for the 'closed' areas in Tibet, which can be obtained after your arrival in Tibet; 04). 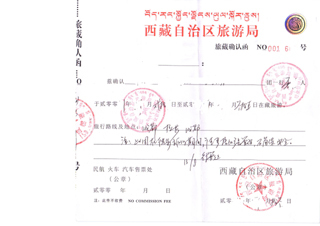 Military Permit, which is for the remote military sensitive areas in Tibet. As a fully licensed tour operator, Splendid China Tours is able to assist you to process all the above mentioned documents if you book a tour with us. Tibet is home to the Tibetan people and borders on Nepal, Indian, Burma (Myanmar), Bhutan and Sikkim. Tibet adjoins Qinghai and Xinjiang on the north, Sichuan and Yunnan on the east. 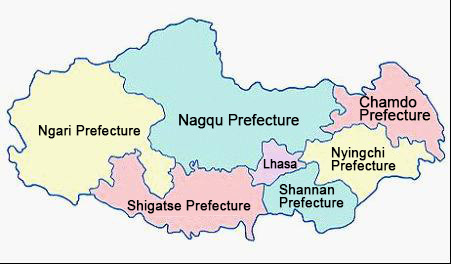 Today's Tibet is consisted of the capital city Lhasa, and other six regions of Shigatse, Shannan (Lokha), Nagri, Nagqu, Ningchi and Chamdo. Most inhabited areas are situatied in Lhasa, Shigatse, Shannan and Nyingchi. Nagri and Nagqu are sparsely populated. The traditional Tibetan culture realm also includes the Kham in East Tibet consisting of Chamdo, part of Yunnan and Sichuan, and Amdo in Northeast Tibet including part of Gansu and Qinghai. Land of Snows, the Roof of the World, is perhaps can not precisely describe what Tibet is. Shangri-La, maybe! Tibet is an amazing place that is the biggest, highest and the youngest plateau in the world. Tibet has some of the world's most breathtaking natural and culture sights, the Tibetan people are extremely hospitable who warmly invite you and welcome you. 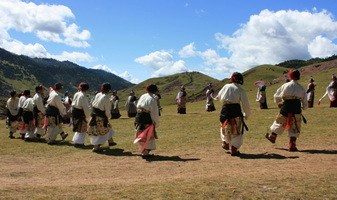 Tibetan culture developed under the influence of a number of factors. Tibet's specific geographic and climactic conditions - its altitude, short growing season, and cold weather- have encouraged reliance on pastoralsm, as well as the development of a different cuisine from surrounding regions. Contact with neighboring countries and cultures- including India, China, and Mongolia-have influenced the development of Tibetan culture, but the Himalayan region's remoteness and inaccessibility have preserved distinctive local influences. Buddhism has exerted a particularly strong influence on Tibetan culture since its introduction in the 7th Century. 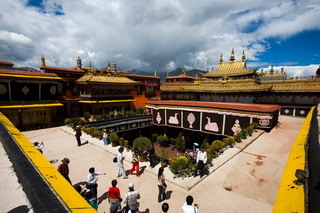 Art, literature, and music all contain elements of Buddhist religion, and Buddhism itself has adopted a unique form in Tibet, influenced by the Bon tradition and other local beliefs. Tibetan Art is the synonym of the art of Tibet and the Himalayan kingdoms which is heavily influenced by Tibetan Buddhism. One might say that Tibetan art is as brightly hued as the five-colored flags that represent blue sky, white clouds, red fire, green grass and yellow earth. Visitors to Tibet are invariably impressed by the local people's power of imagination and boldness of expression in their artistic forms. Religious doctrines have not stifled their creativity. Rather, they have given wings to their imagination. Talent, gifted by Heaven and Earth, shines forth in all their works of art, from architecture to clothing and decorations, from furniture to articles of daily use.